The Manchester Beer Audit will set out to record every draught beer (cask & keg) on sale in the pubs and bars of the City Of Manchester on Saturday 20th May 2017. Teams of volunteers will visit over 300 pubs during the afternoon of the 20th, noting all the beers on sale. *The System One Any Bus Day Saver costs £5.20 (at the time of posting) and can be bought on the bus. This ticket covers all buses in Bolton (and the Greater Manchester travel area). 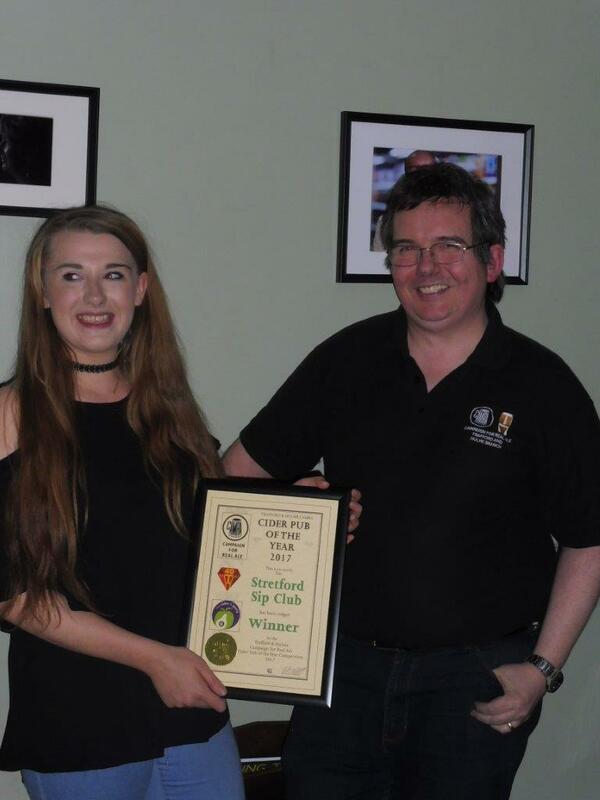 The Sip Club in Stretford recently celebrated their third birthday with a party night at the Barton Road bar. Trafford & Hulme branch took the opportunity to present them with the Certificates for their Cider Pub Of The Year award along with those for being runner Up in LocAle Pub Of The Year and Community Pub Of The Year. Pictured is assistant manager Krista with branch chair John O’Donnell. As a branch we don’t go around Bolton town centre very often but we are going to correct this in our monthly branch social for April. We will meet at Great Ale at the market at 1.30pm on Saturday 22 April. After a beer or two we can move on to some of the other pubs around the centre of Bolton. Ending up at Great Ale at the Vaults.